Editor’s note: USA Today and the corporate media follows the lead of Infowars.com and Prison Planet.com, again demonstrating that the alternative media takes the lead on important stories. 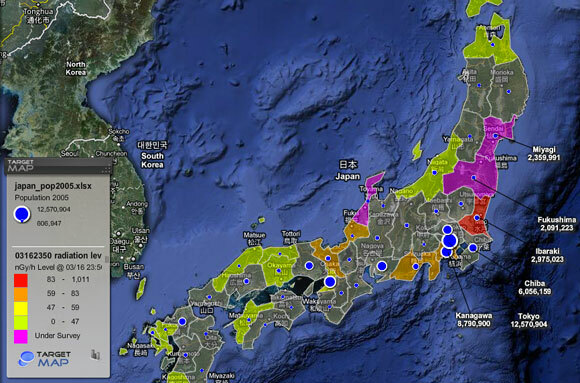 A data map of radiation levels in Japan posted on the TargetMap website has omitted information from the Fukushima Prefecture where nuclear reactors are currently melting down. The map reports a “survey” of the area is currently “underway,” in other words the Japanese government is not reporting the obvious fact the area is contaminated with deadly radiation and it does not want the Japanese people or anybody else to know the full story. A coordinated coverup of the severity of the situation is underway. This sort of behavior is typical of governments, especially when they are interested in protecting their power base and protecting the interests of transnational corporations. Normally stoic Japanese citizens are outraged over the lack of information forthcoming from the government. “Residents who have been evacuated after a radiation leak from a quake-hit nuclear power plant have expressed their anger with the lack of information about the incident and how to respond to it,” The Mainichi Daily News reports. In the United States, countless numbers have flocked to stores in pursuit of iodine tablets, said to help prevent thyroid cancer. Americans are obviously not buying the line promulgated by federal and state government that radiation does not pose a threat. Katrina and other incidents have instructed the people in the uselessness of government and its desire to protect them. Increasingly, people understand they have to be proactive and protect themselves and not rely on a gaggle of self-serving bureaucrats. In Russia’s Far East, residents on Wednesday stocked up on iodine and checked radiation levels. Russia’s emergencies ministry toted the same line as other government’s around the world – there is no risk to human health and no danger from radiation is expected. Potassium iodide tablets have been given to some U.S. military flight crews near Japan and the no-go zone for soldiers and sailors is larger than that declared by the Japanese government for its citizens. The U.S. military has developed a radiation protection drug known as Ex-Rad, but it is not currently available for the commoners. And yet the Pentagon – or anybody else – for that matter is not testing radiation levels in and around Japan, or if they are they are not releasing the data to the public. The U.S. has positioned sophisticated radiation detection equipment in Asia. For instance, last month the National Nuclear Security Administration announced the successful installation of radiation detection equipment at the Port of Kaohsiung, Taiwan. The equipment, however, is not designed to detect radiation escaping from nuclear plants built by transnational corporations such as General Electric, but is intended to be part of the effort to guard against the ostensible threat posed by CIA created terror groups such as al-Qaeda. The Department of Homeland Security, in cooperation with the the Department of Energy and the Department of Justice, has doled out millions to a program designed to refurbish, package, and distribute surplus DOE equipment to agencies nationwide with the stated purpose of providing equipment to mitigate terrorist, chemical, biological, radiological, and nuclear threats. The equipment is not intended to detect radiation from exploding transnational corporate nuclear reactors, obviously a much more ominous threat than one supposedly posed by Muslims operating from distant caves. As a recent Wikileaks revelation reveals, the government received warnings over the stability of its power plants from an international watchdog more than two years ago, but the warnings were disregarded. In December of 2008, the IAEA said that safety rules were outdated and strong earthquakes would pose a “serious problem” for nuclear power facilities. Once again, government secrecy is the rule of the day and the health and welfare of citizens ranks low on the list of priorities. Government will invariably protect at all cost the interests of multinational corporations, including those building faulty nuclear plants located on or near earthquake fault lines, over the safety and well-being of the people.